You know how much I like unique hot dogs, and I think it borders on art when dog designers go way over the top to give fans a dish to talk about. The Arizona Diamondbacks are the masters of this. Remember they introduce the colossal corndog that was bigger than a chihuahua. Then they introduced baseball's first dessert dog with the Churro Dog. Well, they ain't done. And what better way to offer fans something fantastic and new than to improve upon an already popular product. Introducing the Churro Dog 2.0. Unlike the New Coke debacle, this upgrade is actually in improvement. It's like the Churro Dog 2.0 is the high end version of a car model. Instead of leather seats and moon roof, you get strawberry sauce and Oreo crumbs. The Churro Dog. 2.0 starts the same as the original with a split long John donut as a bun. 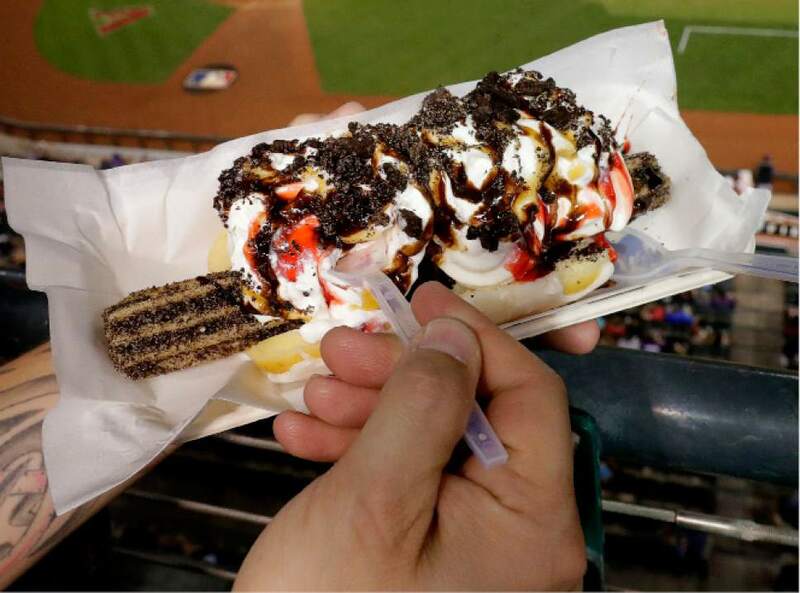 It lays in a churro instead of a meat frank, but this year the churro is rolled in Oreo crumbs. The churro is then topped with frozen yogurt, whipped cream, strawberry topping, chocolate sauce and another round of Oreo crumbs. This dog is not for the light of heart. It is smallish, but I could not finish the original Churro Dog when I had it a few years ago. It is a ten megaton sugar bomb that is not for anyone that doesn't want to finish the game in tight pants. However, if you are willing to run a couple of marathons to work it off, then by all means wolf one down guilt free. One more thing...eat slowly...brain freeze at the ballpark is not fun. Sometimes you just have to catch a game; even if it is not associated with major league baseball. That's where the independent leagues come in. If you live in a town that is not large enough or clever enough to attract a minor league team, the independent leagues fill in the gap. Wichita, Kansas has the Wingnuts for example and Amarillo, Texas....well, Amarillo is working on getting a team. I live in Santa Fe, New Mexico. A town that is a state capital that is so focused on its art scene that it forgot that you need an MLB affiliated baseball team to be considered a real place that most folks will want to call home. I still hold Albuquerque in higher regard, mainly for keeping it real and having an MiLB team. We have the Fuego, a team that is part of the independent Pecos League. The Pecos is expanding, and now has some interesting venues, but it will never compete with MiLB teams. Level of play is better than high school but less than single A level ball. It makes for some very interesting, and high scoring, games. 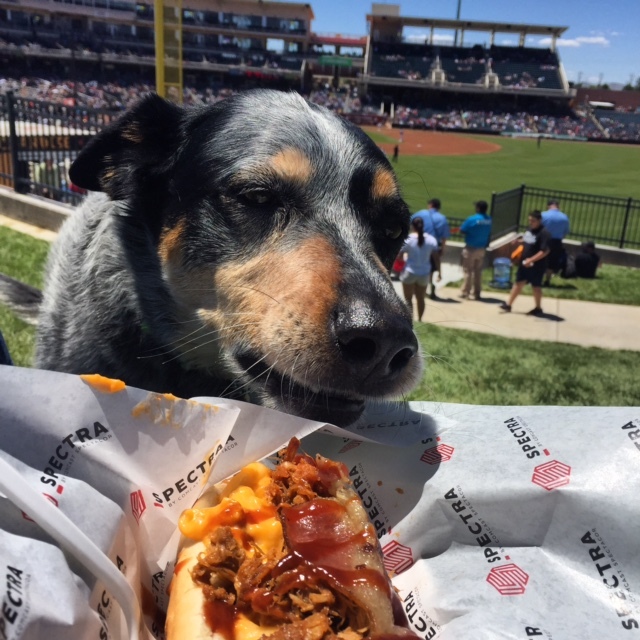 At least our team in Santa Fe offers a decent specialty dog. For eight bucks you can get a red chili, cheese dog. It also has beans in it. While unique (red and green chilis are a New Mexico thang), it is a so-so concessions choice. It is an absolute must eat it with a fork or most of it will end up on the stone bleachers at Fort Marcy park. I think the frank was a Ballpark brand, which isn't bad but it is no Nathan's or Hebrew National. And the price is about two bucks too expensive. Plus, it didn't fill me up. While I love hot dogs, at the Fuego game the Frito chili pie is a better choice and provides more bang for the buck. I would never recommend a dedicated road trip to see the Santa Fe Fuego play. But since Santa Fe (for reasons unknown to me) seems to be a vacation destination for many, if you are in town you should catch a game. And after staring at pieces of art that you cannot understand or identify that costs thousands of dollars, a six dollar seat on hard stone will seem like a bargain. And it's baseball. Baseball trumps art any day. After checking out dozens of other teams, I finally made it to my local MiLB ballpark: Isotopes Park, home of the Albuquerque Isotopes. I would have gone earlier, but warm weather comes late to the high desert. While I love baseball, I do not like watching it in football weather. The Isotopes' mascot is orbit, you know, like proton and electrons orbit the nucleus of an atom? Yeah, science was not my strong suite in school either, but I could explain the infield fly rule like nobody's business. Anyway, the specialty dog at Isotopes' Park is called the Orbit Dog. While it is a regular sized hot dog, it is piled high with awesome toppings. It starts with a regular hot dog, put on some mac 'n cheese, put some pulled pork on top of that and garnish with BBQ sauce and a strip of bacon. It is a delicious tasting treat that anyone will love. It is like having all of your comfort foods on a bun. Guess who else loves this dog? Dogs, that's who. It was also the Isotopes' annual Bark in the Park event and I took my Blue Healer mix Fern. That's a picture of her checking out my colossal treat. I did buy her her own regular hot dog, which she downed in about twenty seconds. It didn't seem fair she got a mundane dog and I the Orbit Dog, so I shared the bacon strip with her. She seemed satisfied with that deal. In case you haven't read about my previous trips to Isotopes' park, it is one of my favorite in all of minor league baseball. And, it is a true eater's park. In addition to having some stupendous hot dog choices, there are tons of other great food options. And probably the only condiments stand to have green chilies as a standard feature. It is New Mexico after all. This blog serves to chronicle the host's travels to ballparks in search of the best hot dog a fan can experience. 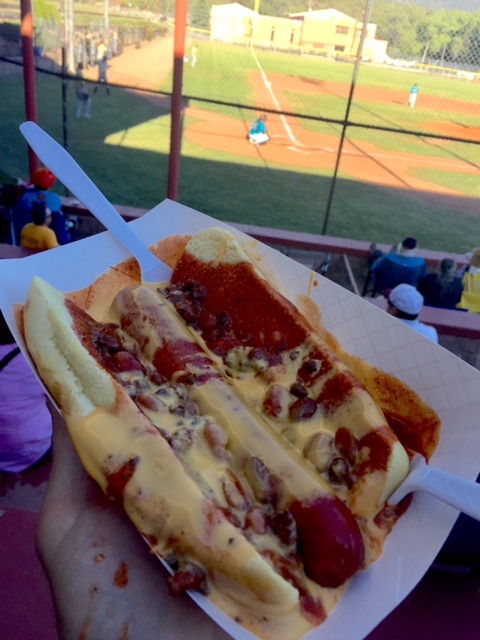 It is a mixture of baseball, Americana and the food that binds the two together...the hot dog. Your comments are most welcome. PLAY BALL!